Check out another rad entry in our Write to Surf competition, which has some great prizes up for grabs (see below for details). This is my friend Chad Marais and he’s about to get the barrel of his life at Rifles. The full sequence of Chad, from his last minute take-off to victorious salute will be forever etched on the Mentawai patch of my brain. What this photo doesn’t show you is just how the wave had squared up on the inside section of the reef and with a cobra like action, it kinked and arched itself as Chad took off. There was a moment where the darkness of the Rifles reef seemed to stretch its finger tips up from the depths and try to yank him into its razor sharp bed. He barely escaped. How I know this is because I was in the rather unfortunate position of being in the direct path of this particular waves’ thickened lip as Chad found his feet and turned beneath it, threading a perfect line between what may as well have been my floating corpse and the ferocious lip which seemed hell bent on hurting someone. What happened next was from the perfect script. Having negotiated the drop and rocketing off the bottom, Chad took his saucer eyes into a pit so square you could hang pictures from its walls. The time he spent getting shacked were the self same seconds I spent getting absolutely smashed. One of those failed duck-dives where it feels like a brick of C4 has exploded between your arms as your board is ripped from your grasp and rag-dolled mercilessly along with you on a tour of all the sharpest parts of the reef. I surfaced to wild beer-filled cheers from our boat, anchored in the channel, as Chad kicked over the back. You can see it in his body language; those few seconds drained him, the pure beginning-to-end intensity of it all. What a way to end ten days in paradise. It was the last session of our trip. The sun was setting and we’d spent the best part of two days surfing the best waves I’ve ever seen in my life. This was what we’d come for, what each of us had imagined as perfection, yet in the true depths of the sub conscious denied its very existence. 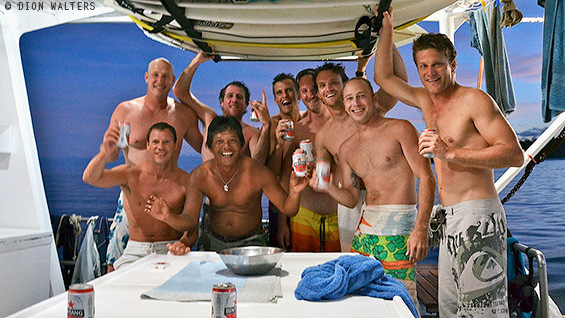 One by one, our crew picked off an absolute bloody final wave and nearly all had either the wave of their life or the wave of their trip, before paddling back to the cheering crew screaming Bintang salutes into the darkening skies. It’s not all palm trees and puffy white clouds out there. At six feet, perfect and crowded, the unregulated line-up at Rifles can be fraught with bad mannered snakes and drop-ins. The wave is located in amongst a handful that make up the Playgrounds area of the Mentawai Island chain, and hence there are boat loads of punters dropping anchor at the slightest sniff of a south swell and light north west wind. Rifles is the premier attraction. It has been given enough face time online and in the glossy pages of magazines to ensure its notoriety as one of the world’s very best waves – if not the best wave. Sure, it’s miles away from civilisation and costs time and money to pursue, but there are enough surfers world-wide with dollars underwriting their bucket lists. There are impatient French, over-zealous Americans, frothing South Africans, dominating Hawaiians, totally mental Brazilians and a whole tribe with a cross section of these traits. There’s six, eight and ten-second tubes dropping like pool balls at a busy Stones bar, heightening tension and fuelling the already scorching flame of desire in the bellies of each surfer out there. Then there are of course the broken boards, smashed up faces and shredded limbs that go with putting it all on the line. But negotiate the noise and Rifles will uncover a path that leads to a place where grown men cry. I still think about this day out at Rifles. It sometimes comes to me in the in the middle of the night when I can’t sleep or when I’m alone in the car. When I’m reading books to my daughters at night, I’m often thinking about it. When I’m working, it pops into my head. 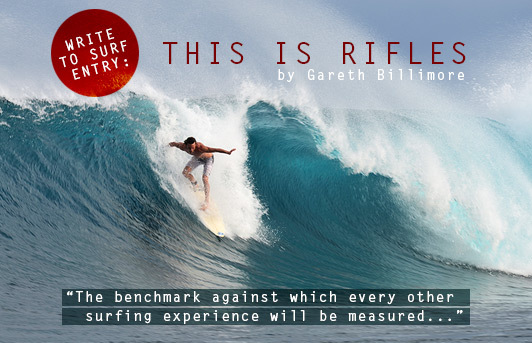 It’s the benchmark against which every other surfing experience now and in the future will be measured. Send your stories to calvin@zigzag.co.za. One submission will be selected every six weeks to appear in Zigzag magazine. The selected submission will also receive a hamper from Billabong. Zigzag retains the right to use any work submitted for the Zag Surf Journo competition on www.zigzag.co.za as outlined in the rules and terms of the competition. Zigzag reserves the right not to award a published winner in the magazine every six weeks, depending on the quality of entries. Zigzag is not obligated to run any and all entries submitted, either online or in print. Zigzag retains the right to edit all work submitted for brevity and / or clarity. 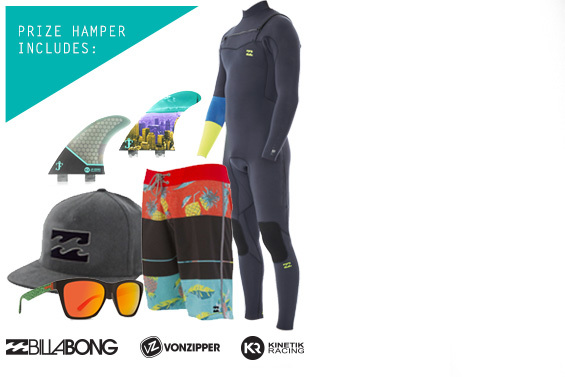 For the next three issues the Billabong prize hamper includes: 1 x Billabong Wetsuit; 1 x Billabong Boardies; 1 x Billabong Cap; 1 x Von Zipper Sunnies; 1 x Set of Kinetic Racing (KR) fins. After which the hamper will get a shake-up with new product of equal value for the following three issues. Yip I can relate to this ….especially for the okes in their mid to late 30’s …kid’s, job+commitments cannot wipe these moments outta your kop. Used up the education fund for a mission to an exotic spot and now back to the 7 to 5 grindstone.